Volatility continues amid headline noise on trade. Recent headlines have been enough to unnerve even the most seasoned investor. The tension between the United States and the rest of the world seems to increase daily. On Friday, the United States threatened to levy another $100 billion of tariffs on Chinese imports, which would bring the total to $153 billion. Because the United States exported only $130 billion to China last year, it may prove tough for China to reciprocate in kind. While much of this is likely posturing ahead of some final agreement, the tone of the discussion is creating a sense of unease. The discord and uncertainty are evident in market volatility, which has surged. The Dow Jones Industrial Average fluctuated in a 2,000 point range throughout most of February and March, after a steady two-year climb. Interest rates are also moving higher. The 10-year Treasury bond, which yielded about 2.25% last fall, now yields over 2.8%. The rate charged to corporate borrowers is up even more, as the yield on Baa-rated corporate bonds has increased by about 0.5% since January. But is all of this worry justified? Or is it yet another bout of concern that will end up creating buying opportunities for more patient investors? Only time will tell, but our most recent reading of the market and economic tea leaves points to continued, but moderating, growth. On the growth front, there is some reason for optimism. The latest release from the Bureau of Labor Statistics shows that U.S. productivity growth rose by 1.5% from -0.6% in 2016 to +0.9% in 2017. While below past levels, the trend is in the right direction. They also tell us that private payrolls increased 1.8% in the last year. More jobs and higher productivity are an excellent place to start for explaining growth, especially long-term economic growth. In turn, this growth goes a long way to describe what drives market returns. 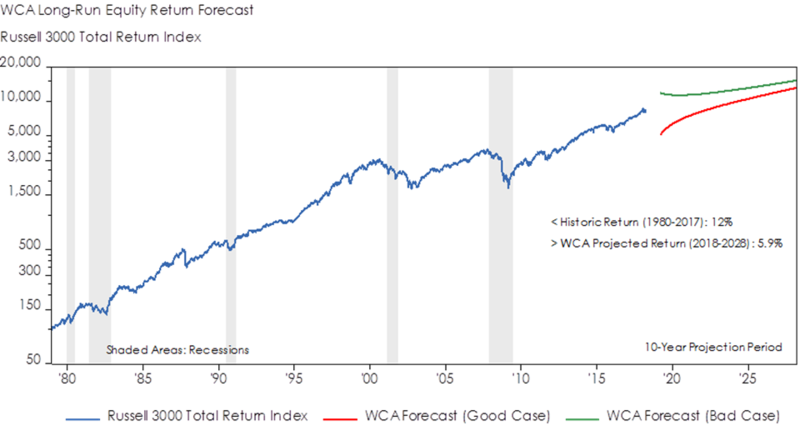 Consider this chart, for example, from the 1940s to today there is an inexact, but clear link between the size of the economy and the value of stocks. The same cannot be said about interest rates, tax changes, or even political party influence. While all of these things can and do impact the short-run, leading to expansions and occasional contractions, other forces appear to dominate the long-run growth story. We believe productivity, investment, and demographic trends do a fair job explaining the bigger picture. We incorporate this point of view into our long-run forecasts, along with our assessment of valuations, profitability, and near-term business conditions. Currently, we expect to see positive contributions to long-run (+10 years) domestic equity returns coming from economic growth, dividends, and share buybacks. These positives are tempered by expected declines in profitability and multiples over time. The net result is a 5.9% expected return as our base case, within a broader range of potential outcomes (graph, below). Note that this return expectation is lower than history and the 7% approximate long-run return assumptions often assumed by institutional investors and pensions. Rather than focusing on each day’s headline “noise” or every bump in the market, it is important to adopt a point of view that is consistent with your goals. Focusing on the mix of assets and the fundamental nature of the businesses that back those assets is most important. A view that balances the potential for longer-term reward with a realistic understanding of day-to-day market risk can help. Ultimately, portfolios must be built to handle two types of risk — “now” risk and “later” risk. The risk of a loss “now” can be reduced by moving to safer assets like cash or T-Bills, but only at the cost of increasing the of the risk of falling short of your long-term investment goals “later” on down the road. Like so many things in life, balance is the key to staying calm and sane when markets become tumultuous. This commentary often expresses opinions about the direction of market, investment sector and other trends. The opinions should not be considered predictions of future results. The information contained in this report is based on sources believed to be reliable, but is not guaranteed and not necessarily complete. The securities discussed in this material were selected due to recent changes in the strategies. This selection criteria is not based on any measurement of performance of the underlying security. Washington Crossing Advisors LLC is a wholly owned subsidiary and affiliated SEC Registered Investment Adviser of Stifel Financial Corp (NYSE: SF). The Dow Jones Industrial Average is an index that shows how 30 large, publicly owned companies based in the United States have traded during a standard trading session in the stock market. The Standard & Poor’s 500 Index is a capitalization-weighted index that is generally considered representative of the U.S. large capitalization market. The Russell 3000 Index measures the performance of the 3,000 largest U.S. companies based on total market capitalization, which represents approximately 98% of the investable U.S. equity market. The average market capitalization is approximately $4 billion, and the median market capitalization is approximately $700 million.